So, I went along to Old Trafford for the 2016 Football Blogging Awards last night and, as always it was a brilliant night. 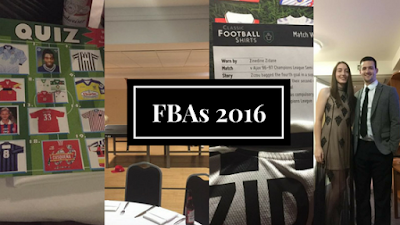 For those new to the blog, I've been attending (sometimes winning the odd award too haha) The FBAs since they started back in 2012. The event has come a very long way since its humble beginnings in Stockport so Anthony the organiser must be praised for that. I was sat on a table with some of the guys from the superb @AnfieldHQ and also a young up-and-coming Man City blogger/youtuber named Omar who runs @CitizensTelly so please do give them a follow! One of the highlights of the night was the hilarity that ensued when Stevi Ritchie (bloke who was once on X Factor) began to sing You'll Never Walk Alone. I'd already had enough of seeing Fergie's face round every corner so blasting out a rendition of #YNWA inside Old Trafford was more than enough to cheer me up, absolute quality haha.